Every time I look at this sandwich, my mind goes blank and I start to salivate a little. It’s not just a BLT — it’s something to behold: creamy, crispy, salty, sweet and juicy. The mind blankness makes it hard to write … let alone come up with some entertaining introduction. So, let’s pretend that I already gave you some well-written lead in. Please? Ok. 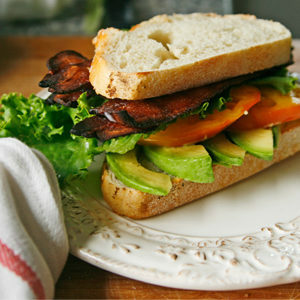 So, this sandwich … I’ve been lovingly calling it the BLAT, which stands for Bacon, Lettuce, Avocado and Tomato Sandwich. It’s amazing. 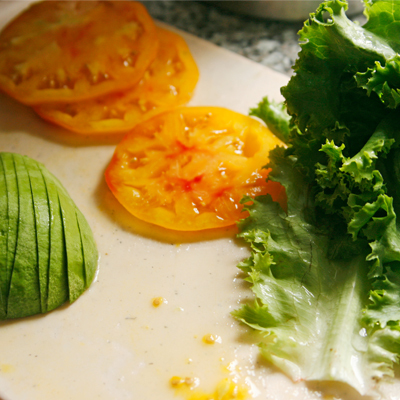 Creamy avocado, sweet heirloom tomatoes, salty bacon and crisp lettuce – like a bite of heaven. BLT sandwiches became a minor obsession of mine in early August. As soon the first heirloom tomatoes appeared, visions of colorful slices in bacon-loaded sandwiches danced in my head. I couldn’t wait to have one. This whole thing came as a surprise though since I have never been a big BLT fan. I mean, it’s just lettuce, tomato and bacon, right? That’s what I have always thought. I was wrong. So wrong. 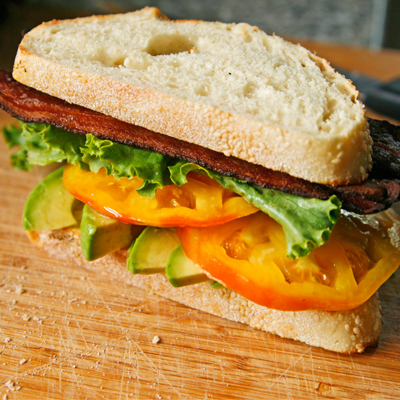 A BLT sandwich can be something amazing, if you do it right. And by that, I mean that it’s all in the ingredients. You have to start with good bread. I like a nice semolina bread with a soft crumb and a not-to-hard crust. This loaf that I came from the bakery of my local grocery store and was very good — similar to my favorite semolina loaf that I buy at the farmers market whenever I can. But whatever bread you love works. Perhaps a few slices of a fab multigrain loaf? Next to the bread, the most important part of a BLT is the bacon (of course!). 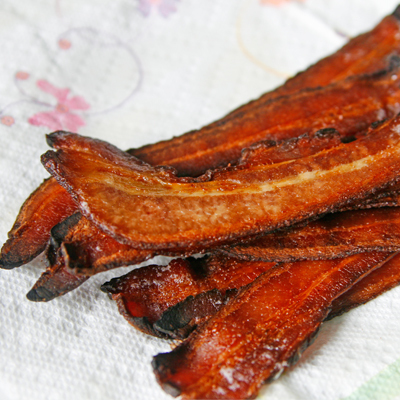 I like my BLT bacon to be thick, meaty and really flavorful. It can’t be salt-overload. It needs to have subtle whispers of layered flavor. As for cooking method? Use whatever method you prefer … but I totally baked my bacon to avoid the mess. Then there is the other fillings. Don’t let up on the quality now. The better your ingredients, the better your sandwich. I swear. For this one, I used heirloom tomatoes, avocado and really good, fresh green leaf lettuce. Because I added avocado, I skipped the mayo. The avocado adds the right amount of creaminess to the sandwich on its own. Once you have all that, you only need to put it together and enjoy. How could you not? Do you like BLTs? What are the most important components? 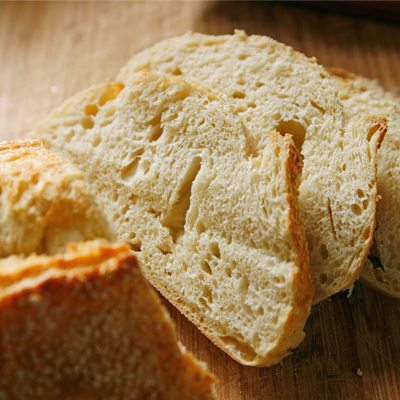 Lay out four slices of the bread on a cutting board. Top each with 1/4 of the avocado slices. Follow with tomato slices, lettuce and finally bacon. Enjoy immediately. That bread look so so good. I want this sandwich, asap! I don’t understand why anyone would make a BLT without avocado! that has to be the perfect blt! I love love love the addition of avocado! I’m gonna prepare an exact replica of your BLAT. Its such a sumptuous meal. The thought of all these flavors and textures together is actually making me miss bacon. Which is quite a feat. 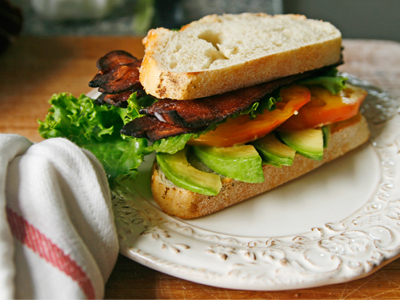 Sometimes foods are classics for a reason – your BLT plus A looks lovely! This photograph does not just depict a “BLT.” Every item you show is GORGEOUS and looks like it tastes better than any bacon, lettuc, tomato or avocado (or bread) we’ve ever had before. Goodness me, this looks GREAT!!! !